OC is a term friends use loosely on me. It's a hard trait to live by and I DO NOT consider myself as Obsessive Compulsive. Being one is too tiring, imagine being particular about every little detail? I sweat just thinking of it. I would rather be filed under "Selective OC" since it only applies to parts of my life. In honor of my partial OC-ness, I'm writing about it. I got this link from a work contact who doesn't know about my "condition". Sure it was a PR gimik and should not be considered a "sign", etc. It made me smile though. People these days type not write. I miss literally writing and I'm glad I've been doing more of that lately. Writing has helped me slow down, gather my thoughts and focus. Back to the link. Free Post its! Now, doesn't that make the OC in you giddy? Just make sure to give your real name cos you'll need to present an ID to claim these freebies. Have you received your package? 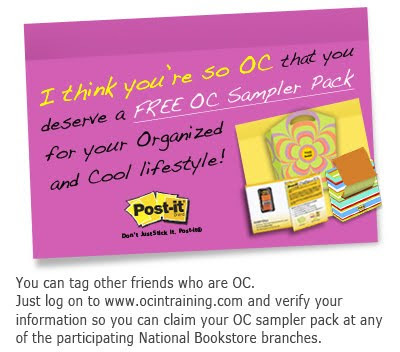 Send an OC pack to someone who deserves it!